Back in May of 2007, I began to experience some odd symptoms - numbness on my legs, and occasional sensations of coolness or warmth on my left leg, as if my pants were damp or I was standing in bright sunlight. I finally went to my doctor, who did some neurological tests, who ordered a cranial MRI an said I needed to see a neurologist. An initial consult with the neurologist showed nothing (neither did the MRI, which pretty much ruled out MS), and he said that there was probably nothing wrong with me. But, he ordered cervical and thoracic MRIs, just to be sure. I got the CD of the MRI at the imaging facility, got home, and popped it into my PC. As soon as I pulled it up, I knew something was wrong. My spinal cord was obviously being pinched in several places by extruded cervical discs (see preoperative pics below). MRI of the cervical spine. 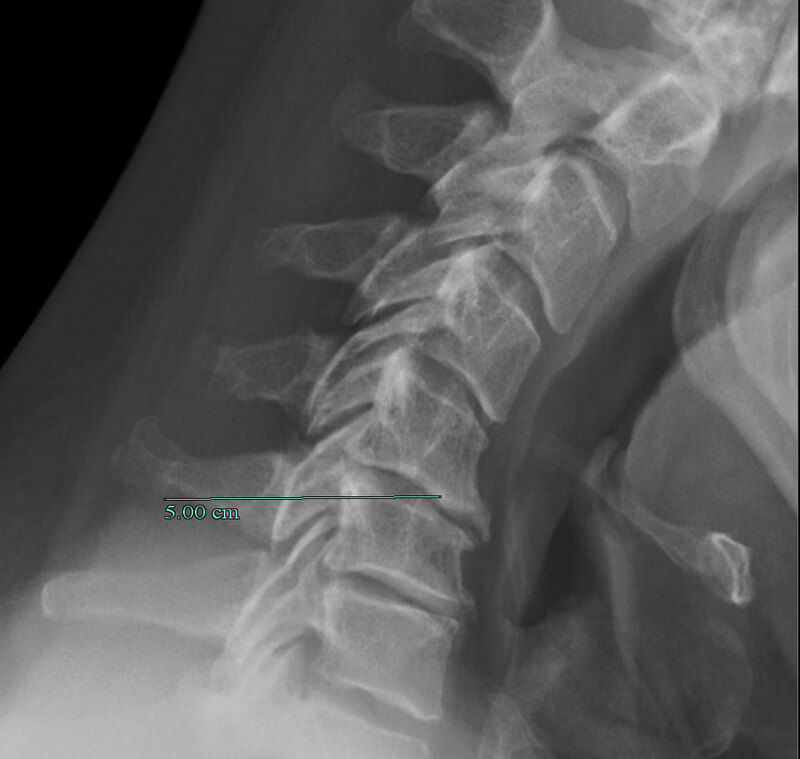 Notice the bulges in the discs pressing on the spinal cord between vertebrae C5-C6 and C6-C7. Also note the whitish areas in the spinal cord where it’s compressed. 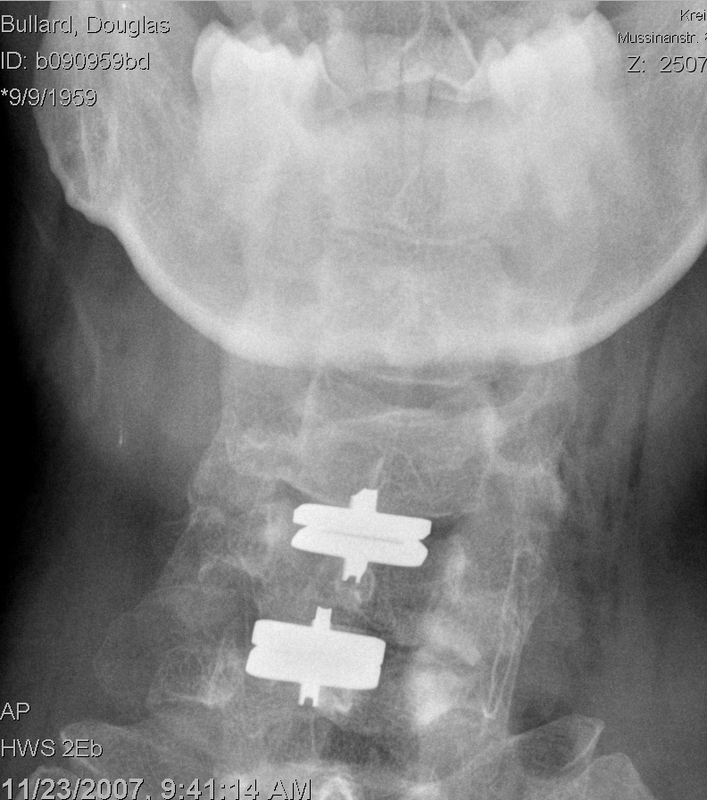 A normal X-ray of my neck, with my chin down. Note the “hooks” in the front of the affected joints - that’s spurs of bone trying to grow around the bad disc. Sure enough, when I saw the neurologist a couple of weeks later (nothing ever happens quickly in US medicine), he had a grim expression on his face, and said I needed to see a neurosurgeon, and to expect to be told that I needed surgery. 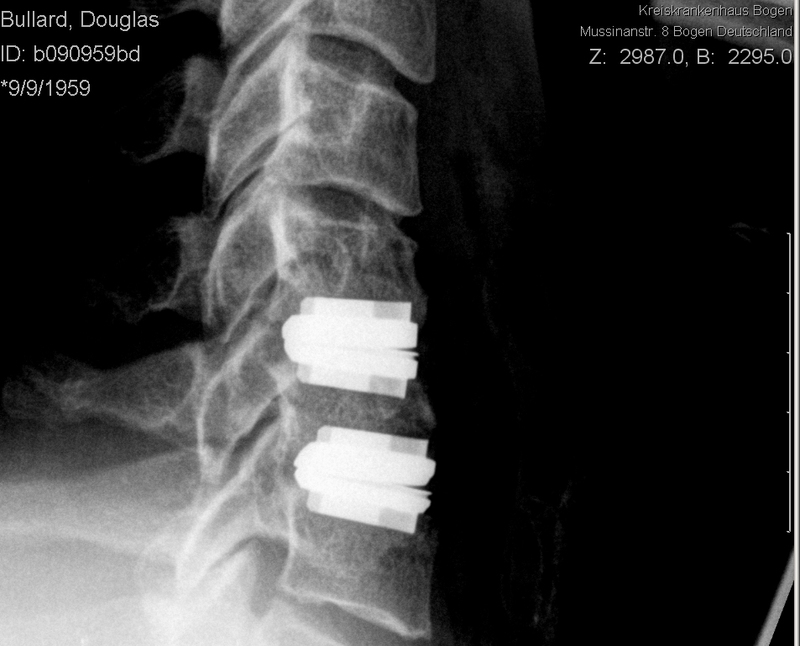 Big surprise, when I saw neurosurgeon #1, he said I needed two joints (C5-6 and C6-7) fused. That’s three out of seven bones in the neck, fused into a single bone. Do nothing and wait for multilevel ADR to become available in this country. Dangerous. If the spinal cord has significant damage, it might not recover after surgery. This could mean substantial paralysis. In a fusion, they remove the discs and any bone material that’s grown. They then replace the discs with discs of bone, and wire everything together with metal hardware. Risk of adjacent joint failure. Because the joints next to the fused ones do all the motion, they have more stress put on them. There’s something like a 25% chance that these joints will require surgery within five years. A laminaplasty is a procedure where they go in from the back of the spine, and make more room for the spinal cord by severing one of the bones that form a cage for the spinal cord, then score the other one so it acts like a hinge. They open the space like opening a door (hence the name, “open door laminaplasty”), and put a piece of bone in the gap that was created to keep the “door” open. In this procedure, they remove the discs, same as in a fusion. But, they then replace them with an artificial joint, in my case a Synthes Prodisc-C.
Less stress on adjacent joints afterwards, should have less chance of adjacent disc failure. Not covered by insurance - time to get a second mortgage! Long-term (decades) data not available. However, the materials used are also used in other implants, and are tolerated well by the body. I chose multilevel ADR as the best option. There’s only two choices: in the U.S., or outside of the U.S. The only way to get multilevel ADR in the US at this time is to participate in an random study, where you might get fusion or you might get ADR - you won’t know, as it’s a blind study. The Prestige is the only ADR available in the US now, but it’s only available for single-level replacements due to limitations of it’s design. Multilevel ADR is not currently approved in teh US by the FDA, and, as a consequence, is not covered by insurance. There are several clinics in Europe which specialize in ADR. Stenum is often reported about in the newspapers, but they don’t seem to have as good a reputation in the ADR community as others. They do, however, manage your whole stay in Germany, which makes things easy. Dr. Bertagnoli and Pro-Spine. After much investigation, I chose Dr. Bertagnoli’s team at Pro-Spine. They just do the medical stuff, they don’t get involved in hotel reservations, etc., but they’re very good at what they do. Dr. Bertagnoli has a fellowship with Yale Medical School, is well published, and speaks often at professional conferences. Lower infection rates than US - about 1/4 that of the U.S. The patient is responsible for taking medications. They’ll give you a pillbox with pills for morning, afternoon, evening, and night. No one really checks to see that you’re taking them properly. Pain relief is given freely, but you have to ask. If you suffer and expect them to figure it out, you’re going to hurt. Pain actually makes you heal more slowly, so be a wimp and ask. Getting out - no paperwork, no wheelchairs. When the doctor says you can go, pack up your stuff and walk out. Pro-Spine has paid the hospital, and unless something drastic happens, you’re all paid up. No towels, toiletries are provided by the hospital. You must bring your own towels, washcloths, soap (for showers), toothpaste, etc. The meals at the hospital were somewhat meager. Breakfast was three pieces of bread, butter and jam, and some tea. Lunch was usually quite good (lunch is the big meal of the day in Germany), but dinner was usually another three squares of bread. That got old after a while. Peter Hoch - Pro-Spine put us in touch with him. He picked us up in Munich and drove us to Straubing, as well as daily taxi service for my mother to visit me in Bogen. Peter is an invaluable resource - he knows all the hotels and restaurants, as well as local area history. When we didn’t like our hotel (see the section on hotels), he checked around and found us rooms at another hotel (cheaper, too! ), even though all the hotels were booked. Pharmacies are very reasonably priced, I spent 27 Euros for several prescriptions. Tips - Most people don’t rely on tips for a living, so it’s not obligatory. Taxi’s typically get 5-10%, I spent 10% extra at restaurants. Note that restaurants that do accept VISA typically do not have any place on the charge slip for the tip, pay it in cash. Those 2 Euro coins really come in handy. Bring your own washcloths, they typically aren’t provided (some hotels will have them if you ask). A suite is not a suite - A “suite” is not always several connected rooms, as it is in the U.S. In Germany, a suite can just be a very large room. If you’re planning on sharing your room with someone, keep this in mind. Munich - Hotel Best Western Cristal. A block and a half from the downtown train station. Good location, lots of restaurants within walking distance. Good breakfasts, has a bar. Not cheap. Ask for a room facing the courtyard, they’re much quieter than the ones facing the street. Straubing - Hotel Asam. A very nice hotel, very modern. But I made the mistake of booking the deluxe suite, thinking we’d have several rooms. Instead, it’s one large room with a bathroom that was all glass and tile, not good for privacy. Hardly any place to put clothes, no place to store bags, minimal closet space. Excellent breakfast (custom cooked eggs, fresh-baked bread, etc. ), excellent restaurant, about kilometer from the town center, so we did a lot of walking. Because of the room issues, we checked out of the Hotel Asam (175 Euros/day for the suite) and found rooms in the Hotel Seethaler (132 Euros for two single rooms). Straubing- Hotel Seethaler. A wonderful hotel for cervical patients if you don’t mind stairs - no elevator. GREAT rooms, right in the middle of the town square, very reasonably priced. Breakfast was slim but adequate. Building is over 500 years old, but the rooms very modern. Large rooms, nice bathrooms, lots of closet space and places to put clothes (this is pretty unusual in Europe). Wonderful restaurant downstairs, great food, reasonably priced. I’ll stay here again if I come back to Straubing. Straubing - Hotel Thereisentor - We didn’t stay here, but some friends of ours did. Very nice rooms, the basic ones are rather small. The larger rooms have nice balconies. No restaurant, but does have elevators. Bogen - Some friends of ours stayed there. It’s much smaller than Straubing. The good thing is that it’s possibly to walk to the hospital to visit, but there aren’t that many restaurants. I’m glad we stayed in Straubing. Duvets - Everywhere I went in Germany, they use duvets instead of top sheets and blankets. A duvet is sort of like a down comforter in a large pillowcase. I found them to be very warm, and if you don’t get the room cool, too hot at night. I think most Germans sleep with a window partially open (I saw many hotel and hospital rooms with the top window partially opened). Internet - Most hotels don’t provide free internet, but rely on T-Mobile’s wireless service. It’s not cheap (18 Euros/day), but if you gotta have it, you gotta have it. 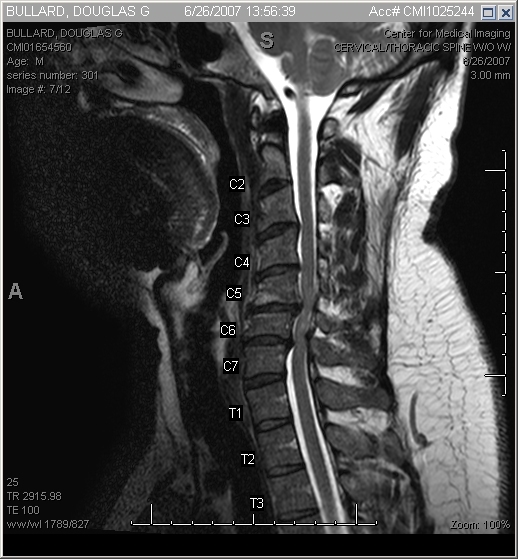 Cervical vs. Lumbar patients - there’s no question about it - my surgery was a piece of cake compared to my roommate. Don’t kid yourself on this one - lumbar surgery is rough! I felt fortunate that I got off as easy as I did, the cervical surgery is a breeze in comparison. But, when Gary got out of the hospital, he was walking straighter than when he went it, and he feels it was worth it. your nose broken, but still, quite irritating. left side, roughly level with his navel. day before, then spent an unpleasant night on the john). hospital 4 days after surgery, he was out 9 days. and was out on Sunday. Total stay: 5 days. following Friday. Total stay: 12 days. I had to wear a soft cervical collar for a month, “weaning” myself off of it after the first several weeks. The pain I felt was mostly like sleeping on my neck wrong - not extreme, but annoying. Massaging my shoulders seemed to help. The thing that made it worse: reading something on a table, pointing my head down, instead of holding it up. I’ve got full mobility - I can turn my head sideways fully, and look up and down fully. There’s less pain at the extremes than there was before the operation, and it’s getting better every week. I’ve been on short-term disability for a month since the operation, and I’ll be going back to work next week, probably 1/2 time for the first week. It’s important not to overdo it - if your neck starts hurting, don’t ignore it and just tough it out. Listen to what your body’s trying to tell you. One good thing I found out - my two implants aren’t enough to set off the metal detectors at the airport. That’s a relief, but it’s vaguely disappointing. I almost forgot - here’s my X-rays of “after”. Ignore the lean in the forward-facing X-ray - I was doing what my radiologist told me to do, I don’t normally lean like that! Two days after surgery - note that the rather sinister “hooks” at the front of the vertebrae are gone. I was positioned exactly where the radiologist put me - I don’t normally lean to the left like this. Note the fin on the implant, which fits into the machined slot of the vertebrae. So, the big question - was it worth it? It’s very early in the game, so I can’t say how it will turn out long-term. However, I have more mobility than I’d have if I had a fusion (and that’s good), and very little pain. The fact that I had the ADR should lessen the chance of adjacent disc failure, so I’m pretty confident that made the right decision.